Dustn Rawl YES IT CAN HAPPEN TO YOU!!! Today I choose to be an encouragement to others in their renewal. This page was very difficult for me to add, but as Dustin and Tiffany's Mom, I do so want this message to get out to all kids and adults. YES, IT CAN HAPPEN TO YOU! My son was a very smart, young man and was an awesome son and person, but on the early morning of Sept 27, 2007 he made one bad choice that affected his life and all those that love him. The reason I say "CHOICE" is because at 18 Dustin told me "mom you taught me right from wrong and taught me what not to do, using yourself as a bad example. I do understand that, but I am older and make my own choices and has nothing to do with what you did or did not teach me". And as most kids he also thought it would never happen to him. So Please! Please! Let Dustin's life and death make a difference in each and every one of your lives and think before making that BAD CHOICE! 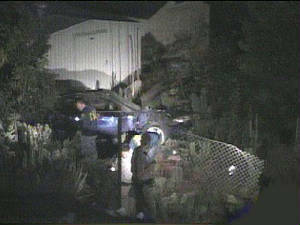 LAKESIDE, Calif. -- A suspected drunken driving crash sent a car careening off an East County freeway and plunging into a residential back yard Thursday, killing one passenger, injuring another and leaving the driver under arrest. According to witnesses, the accident occurred as the speeding driver of a 2000 Ford Taurus tried to pass slower traffic on westbound Interstate 8 in the Lakeview area shortly after midnight, the California Highway Patrol reported. The driver, 27-year-old David Rhodes of San Diego, steered onto a dirt center median near Lake Jennings and then lost control of the vehicle, which skidded across several lanes and struck a BMW sedan before veering off the freeway, CHP public affairs Officer Brian Pennings said. The Taurus overturned and rolled down a bank into a yard on El Dorado Parkway, Pennings said. Rhodes and his two companions, none of whom was restrained, were ejected as the car tumbled down the slope. One passenger, 25-year-old Dustin Rawls of Katy, Texas, died at the scene. The other, a 20-year-old San Diego man, was taken to Sharp Memorial Hospital along with Rhodes for treatment of moderately serious cuts, bruises, abrasions and other injuries. Upon his release from medical care, Rhodes is expected to be booked on suspicion of vehicular manslaughter and driving while intoxicated, Pennings said.